Achieving a Gold Award is one of the biggest milestones in the life of Gold participants. It shows their ability, focus and determination to achieve their set goals and pursue them with passion, perseverance and single-minded devotion to the purpose. While the Gold Award journey promotes the overall development of the participants, it also gives them immense opportunities to learn from their experiences so that they can deal with the challenges that the future might pose. The Gold Award Ceremony is organised every year to salute their indomitable spirit and perseverance. This year's Gold Award Ceremony was organised on 14th July 2016 at the India International Centre, New Delhi. The National Award Authority (NAA) took immense pride in felicitating the Gold Award Holders. This Gold Award ceremony is dedicated to appreciating the milestones and achievements of each participant. The day was dedicated to celebrate, enjoy and cherish their achievements with friends, family and the IAYP team. This year the National Award Authority was privileged to invite Mr Abbas Ali Baig, former cricketer, Indian team as the Chief Guest, who graced the occasion with his presence. 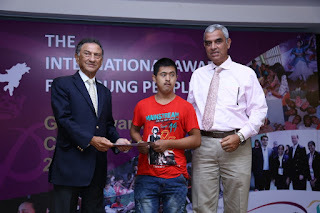 The ceremony was preceded by an interactive session with Mr. Himmat Kalsia (Chairman, Award Programme Foundation) and Dr. Sanat Kaul (Managing Trustee, Award Programme Foundation), who reached out to the Awardees, Award Leaders and parents and initiated a dialogue about the Award Programme. They asked the audience to provide their experience and feedback and suggestions that would help the Foundation to advance the Award Programme in India. The host and compere for the ceremony was Pratibha Singh, Award Leader and Member of the National Training Panel, who kept the audience engaged with her lively exchanges and appropriate snatches of poetry for each occasion. She commenced the Gold Award Ceremony by welcoming the Chief Guest and all the Awardees, Award Leaders and Parents. Mr. Kapil Bhalla, National Director, had the privilege to welcome the Chief Guest Mr. Abbas Ali Baig, Mr. Himmat Kalsia (Chairman, APF) and Dr. Sanat Kaul (Managing Trustee, APF). This welcome address was followed by honouring the school principals who were there to grace the occasion. Mr. Bhalla welcomed and congratulated Mr. Jorawar Singh, Principal, Cambridge International School, Phagwara; Dr. Sumer Bahadur Singh, Principal, The Daly College Indore; for their invaluable contribution to the Award Programme, and presented them the Friendship Badge. A variety of entertainment performances were presented by Award Participants, commencing with a solo song presentation by Aditi from Vidya Devi Jindal School, Hisar. The house was dazzled when the participants form Uttam School, Ghaziabad came to the stage and presented a short tableau about how King Ashoka embraced Buddhism after witnessing the mass deaths during the Kalinga War, a war that he himself had waged out of a desire for conquest. This tableau was followed by a presentation from the participants from Sri Sarada Math, Rasik Bhita about the Gender Diversity and Empowerment Project. Konkana and Swagata shared real life experiences about their efforts to approach and reach out to the underprivileged; they also described how the community is benefiting. After this, Abijeet Nagpal from The Scindia School, Gwalior shared his experience of a cycling expedition from Manali to Leh through a short film. After the entertainment presentations, National Director Kapil Bhalla addressed the audience, sharing information of the progress of the Award. He outlined future plans that have been designed to spread the Award Programme to untouched areas of the country. Kapil Bhalla also highlighted the achievements of the Gender Diversity and Empowerment Project run by IAYP India under ISPG Grant. With immense pride, Kapil Bhalla applauded the four participants with special needs from Raphael Ryder Cheshire International Centre, Dehra Dun, who received their Gold Award and recognition for their extraordinary pursuit. In commemoration of the 60th anniversary of The International Award, a series of short films are being screened internationally, featuring interviews with Award participants and Award Leaders from around the world. Kapil Bhalla shared that the interviews of five Indian participants and Award Leaders have been selected for the 60-minute movie created by The International Award Foundation. His report was followed by a screening of the short films of the Indian participants who were nominated for the 60th Anniversary film. The National Director's speech was followed by the Award Presentation Ceremony where the Chief Guest Mr Abbas Ali Baig handed the Gold Certificates to the participants and also honoured a select group of Award Leaders with Special, Voluntary and Outstanding Service Meritorious Certificates. The Chief Guest in his speech congratulated all the Awardees and Award Leaders for their success. Sharing some life experiences with the audience, he mentioned how he faced challenges when he was young and how he overcome them with focus and determination. Mr. Himmat Kalsia, Chairman, APF proposed the Vote of Thanks at the end of the ceremony. The IAYP thank the Chief Guest, Award Holders, Award Leaders, Principals, Parents, Guardians and our Trustees for being there to make this Gold Award Ceremony a big success. For Gold Award Ceremony pictures, please click here.